As today is the last day of primary school for 9 whole weeks, classes are allowed to take treats into school. Sweets and chocolate are, as a rule, not allowed in school due to a healthy eating policy. For today though, as it’s a half day, the 6 year old was allowed to choose what treats he wanted to bring in. When I asked him what he’d like for his treat I expected that he’d ask to go to the local shop to pick up some goodies. I was wrong. Yesterday I got my instructions. He required vanilla biscuits with icing. 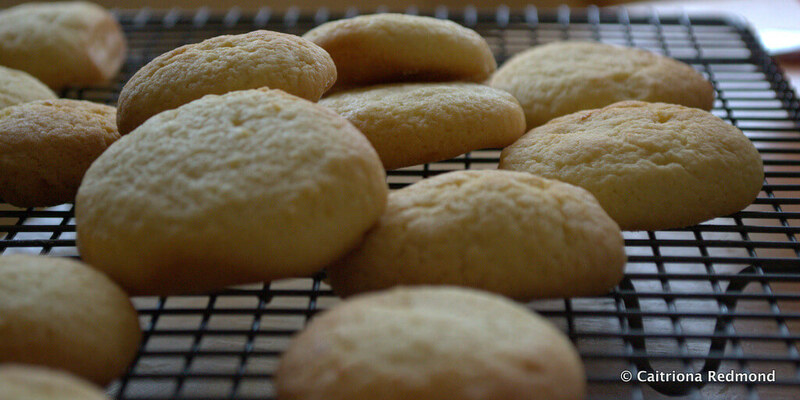 Except when I went to make the vanilla biscuits I discovered I was all out of vanilla. The horror! I did have a lovely stash of organic lemons though, and I figured that my lovely lemon biscuits would have to make do as a substitute. The warm weather means that room temperature butter and eggs are a dream to work with. In fact I made this cookie dough by hand with a big bowl and a wooden spoon in about 10 minutes. That task would normally take far longer in the depths of winter. 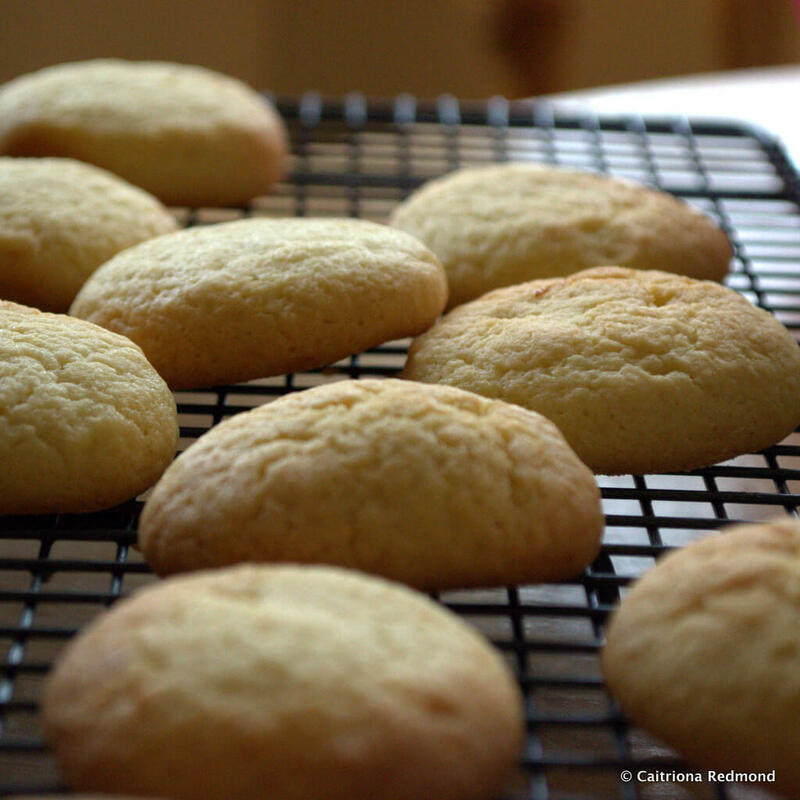 The lovely lemon biscuits don’t need icing. They are perfectly sweet as they are. You know the way there is something pleasing about a plain biscuit? Maybe it’s time to go back to simplicity and stop stuffing biscuits with stuff, or coating them with things all the time. Also, what’s with the trend for giant cookies/biscuits? They’re so darn big! I believe a biscuit should be small enough to be eaten in a bite or two. Less is more. There is sugar in this recipe as it makes for a consistent bake. As the biscuits are small you can control the amount of sugar consumed. 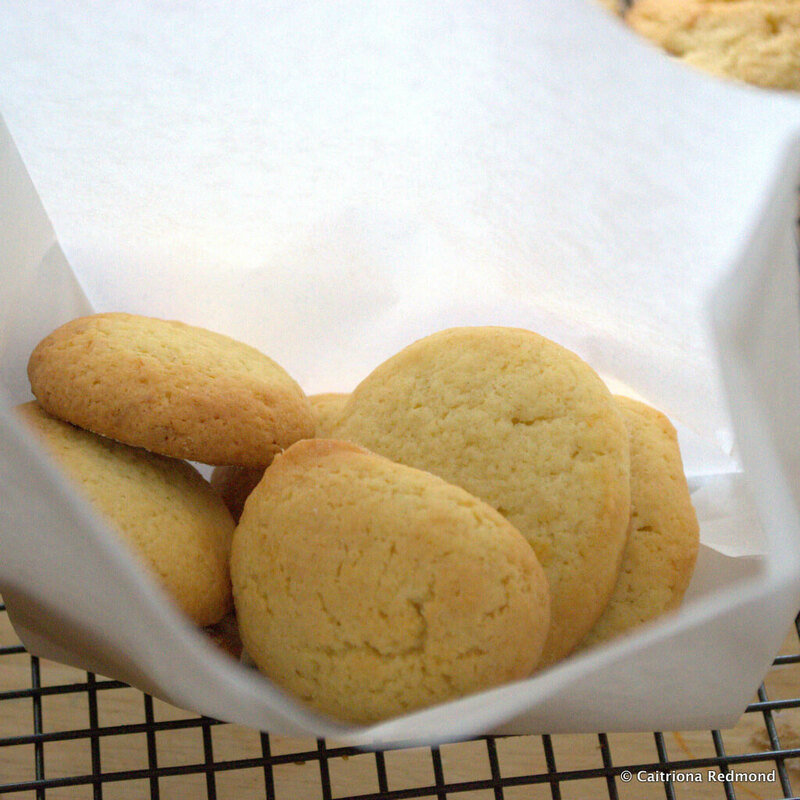 The best way to enjoy these lemon biscuits? Still warm from the oven, with a cup of green tea. I was woken at 6am by a very irate 3 year old standing by my bed demanding to know where his biscuits were. That’s a good 2 hours earlier than his normal rising time. I suspect the baking smell from the night before had something to do with it. Ooops! Note. You will need to make this dough in advance as it needs to chill before baking. I recommend you allow at least 1 hour chilling time so factor that into your preparations. In a large bowl, mix together the butter and caster sugar until soft and pale. I do this using the back of a wooden spoon. Add the egg and beat again until you have a smooth batter. If it appears curdled just keep on beating until it comes together – it will I promise! Pour in the flour and baking powder, stir slowly until the dry ingredients are combined. It might not look like it will all combine but just keep on going it won’t take long. Once combined, rinse the lemon, then grate the rind into the biscuit dough. Then slice the lemon in half and squeeze the juice into the bowl as well. Watch out for pips! Mix the contents of the bowl until you have dough only. Cover the bowl and place it into the fridge to chill. If you don’t have much space in the fridge, transfer the dough to a sandwich bag or cling film, shape into a sausage shape then seal and chill for at least an hour. Preheat your (fan) oven to 190 degrees Celsius. Grease, then dust a heavy baking tray with a little flour. I use leftover butter wrappers for this. Roll small amounts of biscuit dough into marble shapes then press in the centre to get a thick round on the baking tray. The round will be about 1-2cm thick. I normally fit about 15-20 biscuits onto a baking tray. Bake in the oven for 11 minutes, or until the biscuits turn slightly golden on the outside edge. Allow to cool slightly before lifting the biscuits onto a cooling rack. These biscuits will keep for up to 5 days in a dry sealed container. Yeah right. As the biscuit dough contains lemon juice it will keep in the fridge for up to 3 days so you can cut, and bake again to enjoy the biscuits fresh. Alternatively the dough freezes well – for up to 3 months in the middle section (away from the element). Roll the dough into a thin sausage before freezing so you can slice and bake directly from the freezer with no need for rolling. It’s going to be a busy Summer as I’ve reinstated the YouTube channel. I intend to vlog (video blog) at least twice a week, so maybe you might like to nip over there and take a look at my most recent updates? Oh I almost forgot! Was the 6 year old happy? Em, that would be an understatement. Did the 3 year old get biscuits at 6am? Of course not! He’ll enjoy one as a treat later.